Once you have your dough ready, it’s quite easy to turn it onto the Slovak delicacies, the poppy and walnut rolls, makovník and orechovník. Or at least my grandma made it look really easy. These two pastries are identical to each other, except that they have different filling. Start off by making the filling. For the poppy seed roll, you will need ground poppies (mletý mak). For this, you will need a poppy seed grinder (mlynček na mak). These work by pushing the poppies between a housing a spinning plate. You can find these online, so that’s probably the best place to start. Or, you can skip all these steps, and use the poppy seed cake filling found in the baking section. I personally don’t like it much, because I think it tastes more like corn syrup than poppies. We used 100g of poppies. This was not quiet sufficient, as you will see in the final product below. So err on the liberal side. You can never have too much of the good thing, right? Add sugar (cukor) to taste and also few drops of milk (mlieko). You want the filling to have the consistency of thick sauce. My grandma also put it on the stove for few minutes to warm up. 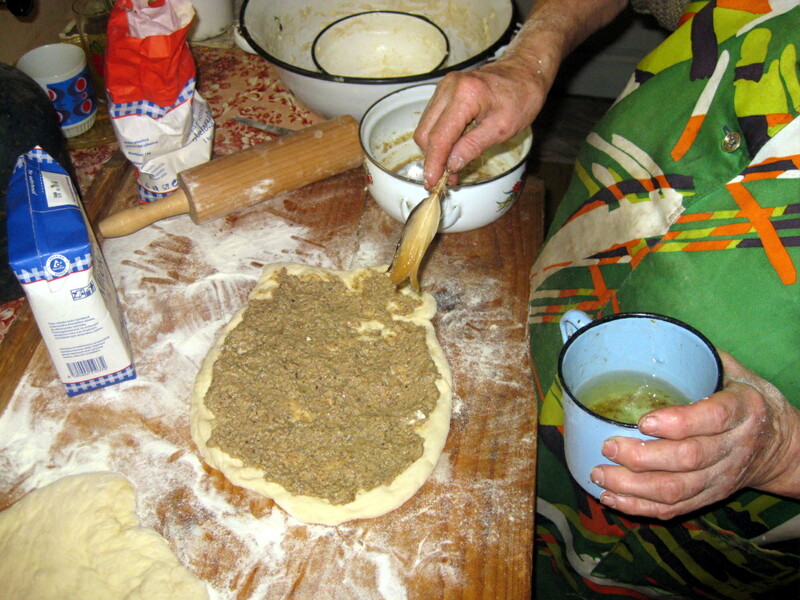 The nut filling is made exactly the same way, except that you use ground walnuts (mleté orechy). Again, add sugar to taste and a bit of milk. Heat up the mixture on the stove. Run over the dough few times with a rolling pin, and then use your hands to flatten it out some more. See the recipe for tvaroznik for photos of this step. Then top it with the filling. My grandma started off with the nut roll, orechovník. Lightly grease the top with oil. Then grab one end of the dough “pancake” and roll it into a tube. Place it onto a greased baking pan, the rolled part to the bottom (the opposite of what is shown in the right photo, we flipped it before baking). I am using my finger here to give you an idea of scale. Makovník (the poppy seed roll) is the made the same way, except you use the poppy seed filling. Then lightly grease the top of each roll with a baking brush. Then set aside for few minutes to let rise. My grandma’s cottage has only a wood burning stove. I found this really neat – cooking doesn’t get whole lot more traditional than this! Here is my grandma’s friend Paľo putting bit more wood in the stove. But for more modern kitchens, you want to heat up your stove pretty high, 400-425F. Bake the rolls for not even 30 minutes, turning around halfway. They are ready when the outside turns golden brown. You can reduce the heat once they start turning yellow. After you take them out, brush the tops with oil. This will soften the crust. And there you have it. My grandma made it look so easy. As you can tell, the poppy seed roll is little skimpy on the filling. As I mentioned above, we didn’t make enough of it. These rolls are delicious with a cup of tea or coffee. 111 comments - What do you think? My mom’s family makes these (Hungarian). I’ve also made them myself, but mine aren’t as good as my aunt’s or my grandma’s. my dedo would buy me one of these (orechovnik– i never knew the slovak name; he just called them ‘strudel’) every weekend when i came to visit. nobody ever bothered making them, because he liked any opportunity to go to the bakery to buy one and spend some time with other slovaks. so thanks for the recipe–i look forward to being able to make one myself, since they cost a fortune in toronto. the blog is great. You can find poppy seed already prepared in the grocery store. Or check on line for Solo brand foods, they make it and sell it. Where can I find poppy seed in the United States? I’ve tried several times, but here the poppy is only a source of opium, not a food item. I don’t know where you live, but in Virginia, the Giant chain supposedly sells bagged poppy seeds in the bakery section. I haven’t tried that yet, but I have bought canned poppy seed pastry filling there, in the baking goods sections (flour, cake mixes, etc…). I also tried getting poppy seeds from an Indian spice shop, but all I found were some mysterious white seeds (see my recipe for plum dumplings). Costco sells them, or if you have a chef friend, all major food suppliers have them for dirt cheap. Also to grind them, you can use your coffee grinder. It’s not usually recommended to use your coffee grinder to do spices, but this is a rare exception. Any other whole spices you grind should be done in a different coffee grinder designated designated as such. I’ve tried this but it didn’t work too well. Did you have good luck using a coffee grinder? The problem with a coffee grinder was that it merely sliced the seeds without releasing the oils. The output from the coffee grinder was very sandy while what you get from the disc poppy seed grinder is more paste-like. Thanks! Your cakes look delicious. Try any “natural food store” or I think it’s McCormic that sells poppy seeds but it’s tiny quantities. I grew up in NE Ohio and was born in PA there are “dutch markets” that sell it in large quantities. Here in Utah you can find it at most bakeries and Winco Foods sales it in bulk for 4.95 lb. If you are looking for a poppy seed grinder you can use a Victorio VKP1012 Hand Operated Grain Mill or the same one from Back to Basic’s. You can find them on Amazon.com. Works as well as my dad’s PSG. Where we lived (Ithaca, NY) they sell bulk poppy seeds in “Green Star” which is a store that sells organic stuff. As far as I remember, they were not that expensive (maybe $3-$4 a pound). There is a brand of filling called Solo. They have a poppy filling, walnut, almond, date, as well as many kinds of pie fillings. Nina You can find canned or jarred poppy seed filling in the bakery isle of the grocery stores. In some areas you can ask at the deli if they have fresh ground poppy seeds. You can find poppy seed in the cake isle of your grocery store or order it from the Solo Company. My grandmother made these..she called them kolache (her parents were from Hungary. We also fill them with cream cheese, ground nuts, or an apricot filling. This looks just like what my mother and grandmother made. It has been years since I last made it, something I have to change! I do agree, the poppy seed filling you purchase does NOT taste like it should – nothing can replace making your own! As “Christi” said above, dear Dad always called this kolache. I remember always having it when visiting Baba and Dzedo. There is a cute story to tell about visiting them – will have to tell it later, as hubby and I are heading out the door. Just found this website and am in LOVE with it! Thanks so much and I’ll see you all later! Looking forward to your story! Kolache is a generic name for “sweet baked goodies”, so technically these are also “kolache”. But really, the term typically applies to cookie-type sweets. Sorry it has taken me so many months to get back with my story! A lot of things have happened in the past year to keep me away from here, darn it! Scared? You’d better believe it!!! About a minute later, my older sister came bouncing in and said “Hi, Baba! and Baba looked at her and said “You see this girl? I’m going to kill her!” My sister looked at me and then at Baba and in a gleeful voice, said “oh, yeah?? ?” I knew that was the end for me! Well, as it turns out, Baba didn’t kill me and over the years, I learned to make a kolache that my dear Dad said surpassed anything that Baba had ever made. Oh that is so funny! This is exactly my own story with my Babci in the 1960s when I was very small. She was tiny but very fierce looking, spoke only broken English with a thick Polish accent. I was in complete terror of her, but I was made to memorize Christmas carols in Polish to sing to her. I remember being so scared I would stammer over the words. One Easter, I caught royal heck from her for touching the butter lamb. My spelling isn’t right, but I thought baked goodies was pechivo. Until I was 8 or 9 I thought that was an English word. my grandmother grew up calling these kolache as well, and her mother was from the part of Slovakia that was Hungary in the past. I have recently discovered that the dialect she speaks is an eastern one, not the same as the Slovak they teach in school, for example. Maybe kolache is the name of this in her dialect rather than a general term for the sweets. Almost everything in Easter Europe was Hungary at one time! Vysťahovalci, ktorí odišli do roku 1918, odišli z Uhorska. Štát Maďarsko vznikol až rozpadom Rakúsko- Uhorskej monarchie. My mother would make these very holiday. This past Christmas I tried my hand at them and I have to say my momma would have been proud. My grandmother made these with nuts, poppy seed, and prune lekvar. The lekvar are my favorite, and I found a recipe in a Slovak cook book that works very well. can i get your recipe for prune lekvar? does anyone know where you can find bags of lekvar (prune or other fruits) in So Cal? I buy a couple each time I go back to Johnstown (PA) to visit relatives, but have never found anything like that out here. While I was taught to make a poppyseed paste as you describe for our kolaches, the nut ones were/are made simply with a mixture of ground nuts and sugar — no milk, no cooking. However, the plates we use on our hand grinder, tend to both grind and smash the walnuts, squeezing out their oils, so the ground nuts are very moist. Adding the sugar makes the ground nuts more like fine crumbles. This spreads very easily on the dough, but makes rolling up the dough a little more of a challenge as the mixture can tumble out each end. The final product, however, is NOT dry, and actually has a better consistency (lighter)than the poppyseed paste ones, which tend to be so moist they fall and flattened while baking. We also sprinkle raisins in with both the nut and poppy seed fillings for bits of sweetness. In the meantime I use a coffee grinder for nuts and seeds. I grind a little at a time and I also don’t use it for coffee. Thanks for all the wonderful recipes! I can’t wait to use some for the holiday season. I was introduced to kolaches in Pittsburgh Pa. They were a tradition with the family of my ex-wife(#1) at holidays and our wedding. The nut rolls were my favorites. It is also kind of bizarre but her family’s last name is Palo like the gentleman in the photo of your grandma’s kitchen. I’m going to try to make kolache again this Christmas using these instructions. Maybe the filling won’t break through the dough this time. How much baking powder is in one of those packets? Great to see an original recipe for these cakes. I need to know what kink of cheese used in the cheese cake. I know raisins were used too. Hi Rijta, the cheese is called tvaroh in Slovak, and you can sometimes find it in ethnic Russian or Polish stores under the name tvarog. In the US, it’s called farmer’s cheese. It’s basically cottage cheese, but dry. You can find it now in regular stores, look in the section next to Feta. I buy brand called Friendship, http://www.friendshipdairies.com/products/farmer-cheese.html. About your other question, that means just to rotate the baking pan in the oven 180 degrees, so that the part that was closer to the back of the oven is now by the door. When you say at half way baking…turn around. Does this mean turn the cakes over or the pan half way around? In Pittsburgh I just knew them as my Baba’s kolache. My wife is making the walnut kolache right now. We love them for Christmas, and the neighbors love getting a kolache from us as a gift. Hi Gary, your family is not alone in calling these “kolache”. I think this is pretty universal among Slovak-Americans. But in Slovakia, at least in my family, these things are not known as kolache. Instead, the word koláče simply means “cakes”. It can be applied to any sort of home baked good – but not usually to these – although historically, koláč (the singular form) used to denote circular pizza-like cakes, topped with sweet farmer cheese, or poppy seeds, walnuts, jam, etc… You can see my failed attempt at making one at http://www.facebook.com/photo.php?fbid=445183988564&set=a.192327933564.128970.120095713564. A better version of kolach is http://www.slovakcooking.com/2010/recipes/kolaciky/. Walnut roll (orechovník) is my favorite! I am from Slovakia and we call zakusky pastry like deserts (pies and cakes) kolace are what you see baked from the rising dough. Hmm, hi “Miro” from “miro”, I knew I did not make that post (not that there is anything wrong with it) and then I saw that it was Miro with cap “M” and not miro. My 3 sisters and I made these this weekend, they were unbelievable!!! We made 5 each of the nut and poppy seed rolls, then had 5 extra so we filled 3 with lekvar and 2 with apricot filling like my grandmother used to! Yum Yum Yum! this is the recipe I’ve been looking for, just like my Baba’s. Thank you. There are also Slovak cookies with walnut or popyseed. Kind of like rugelach, but not. In pennsylvannia, we always called them “Bethlehem Cookies”. They were also rolled with the filling, maybe moister than rugelach, and usually topped with a bit of powdered sugar (not a bunch). My granny always made them at Christmas. Anyone have any idea? My Mother-in-Law made the dough with….1 lb of sweet butter…1 lb of cream cheese…both must be at room tempt…and 4 cups of flour…dough must not stick to your hands but should be moist. Mom made these cookies….she called them Crescents, made with 1 pound Butter, 4 pkgs Cream Cheese, 4 cups flour. Cream Butter & mix one pkg Cream Cheese at a time, add Flour & mix until the mixture works away from side of bowl. Cover with waxed paper, refrigerate overnight. Roll a small portion out on powdered sugar surface until 1/8-inch thick. Cut into squares & fill with nuts, apricot preserves or prune filling. Roll & shape into crescents. Bake 10-15 minutes at 375 oven. After they cool, sprinkle with powdered sugar. This recipe makes about 4 to 5 dozen Crescents. Plan to spend a lot of time in the kitchen. You can cut the recipe in half if you want to just experiment with a new recipe. Have fun! If anyone is looking to buy nut or poppy seed rolls, definitely check out Andrej’s bakery. I’ve had about 4 rolls from him already, and they were all amazingly delicious! kde je prosim ta ten Andrej’s bakery? Ja som v Marylande a makovniky a orechovniky som iba v Ruskych deli obchodoch zatial nasla. Je to tu niekde v okoli Washingtonu? It really isn’t correct to call strudel kolac. Hi Arie, I know. But for one reason or another, makovnik/orechovnik is what people in the US call “kolache” or “kolachky”. This weekend, we drove an hour and a half to the Kolache Bakery in Fredericksburg for the best makovník I’ve had since I was a child. What a wonderful joy to have it fresh and still warm from the oven. Thanks for your links, Lubos! Are you talking about Fredericksburg, Virginia? If so, where did you buy them; what is the name and addess? Thank you! Joyce yes, its in Frederigsburg VA. Lubos has a link on link site, unfortunatelly it says the site is down today on that specific link. We also call this kolache in my family and I make it every Christmas. I use my Baba’s recipe, but mine sometimes have a tendency to burst open along the sides. Does anyone have any tips for avoiding this? Thanks! The spilled poppy seed filling is the best part to eat. Especially if the honey has hardened. Try a little less filling and make sure to refrigerate you dough overnight. omg. just made this for the first time. everyone else uses alot of butter shortening tons of eggs. my mom can’t remember. ty. the kolaccky are in the oven.. I’m 60 on thursday can’t believe i made these. Just ordered ground poppy seed online. Haven’t been able to find it locally any more. The canned poppy seed mix isn’t very good. Hope this works out as good as I remember my mom and grandma made. My aunts are 90 and 95 and will be thrilled to have this again. Anyone know where I can buy ground poppy seed? We live near St. Louis MO. I agree. I buy whole poppy seeds and grind them at home. You can buy a seed grinder for about $20. Finding the whole poppy seeds if bit tricky but sometimes you get lucky and can get the bakery in your local grocery store to hook you up – they usually have whole bins of them to use when making poppy seed bagels. Where did you get your grinder? I’ve looked online and at some of the big chain kitchen stores and can only find Really expensive ones. I am so excited to find this recipe and your site!! Callie – did you ever find your poppy seed grinder? I use my electric coffee bean grinder and find it works incredibly well. I just have to grind small amounts at a time because as the seeds grind, they tend to bog down the grinder. But my grinder is old and that may be the problem. BTW, mine would burst every time. I used to make a few vent holes all over the surface (with a fork), but it would still burst open on the sides. Then I would make cuts on the top with a knife–to no avail. I really think it’s the darn SOLO filling–it’s heavy, sticky, and too moist. The poppyseeds need to be mixed with sugar, not corn syrup! My mother in law (and all of us at christmas)from slovakia uses some finely grated lemonrind in the poopyseed mixture and some vanilla sugar in both the poppyseed mix and the nut mixture. also we use water as it is hot in autralia. I too live in Melbourne and have found something close at the Vic market. I’m going to try making both poppy seed and walnut kolac! I have a clear memory of my Grandmother and her friend (they came to Canada on the same ship from Slovakia) making treats on a large kitchen table. I would love to learn Slovak, I grew up hearing it but was never taught. They used to offer it as a short course, but that was when i first moved to Australia. I’ve found your website a few months ago and finally got time to try a recipe, and this one was my first choice. It is absolutely delicious! My grandfather was a beekeeper, so my grandmother would sweeten the poppyseed filling with honey and a pinch of cloves. She would bring to a boil for 5 minutes, and do the strangest thing: mash up some cornstarch with butter and add it to the mix with the white of an egg! I use a coffee grinder for the poppyseeds and make the filling in bulk for the holidays, it freezes well in tupperware. Later in her life after my grandfather passed, my grandma would order her poppyseed filling in big #10 cans from a company called Caravan. But she always had makovnik on hand to serve her guests with tea or coffee right up until her death in 1990. I’m the only one in my family who carries on her tradition. I have been baking Orechovniky for several years with walnuts, honey & white raisins. Yhe nuts seem easier to spread with the honey. I’ve got the recipe my Baba handed down to my Mother. She passed on last year at the age of 92 and before she died, she gave me her Slovak Recipe book. It’s tattered, torn & brown, but I keep it covered & use it a lot. My Baba and Mom always baked the nut & poppy seed rolls for Christmas, New Year’s & Easter. If your filling, nuts, poppyseed, etc. breaks thru while baking, you’ve rolled your dough too thin. Also you need to tuck the ends inside the roll and that keeps the filling inside also. I’ve used several of your recipes lately…them being in English makes it alot easier and faster for me ;)!! I’m attempting the orechovnik today, wish me luck!! We always called these Kolache, and made them with nut, apricot or prune filling. Usually a few of each flavor. My grandmother also made the poppy seed. We put a teaspoon of vanilla in each of the fillings, including the nut. For the apricot, you use dried apricots add water to cover in a pot, and simmer till the apricots are soft enough to fall apart, then add granulated sugar to sweeten and a tsp. of vanilla. Same for the prune filling. We baked our rolls at 300 degrees for about 30 minutes. Each person has their favorite but my entire family loves them. When i make them, i have to ensure that everyone gets one of each roll to take home, plus what we eat there. Otherwise, fighting can break out over who gets what!!! HI–has anyone ever heard of a sweet called “bulbulki” or something like this? It is made with poppyseeds and there are small, round dough peices which are mixed with the sweet poppyseed. I have been trying to find a recipe for it for a long time with no success. thanks! Slovak ancestors that left with you younger generation their mastery in baking and cooking most traditional and mastered dishes from necessity of the times when they live. You are blessed with good culture to continue to be preserved. I live in an area where no one even my husband had even heard of nut or poppy roll. My grandmother used to make it and when you are young you don’t ever think it will be something you will later miss so much. I wish I had learned to make them myself. I do remember the grinder. By the way Penzeys Spices sells poppy seeds and Charnushka, Russian Caraway, for the top of homemade bread. It was my grandmother’s secret to making bread fragrant. Thank for sharing your recipe, keep sharing family secrets or they will get lost over time and that would be a shame. I’ve been reading all your comments and crying because of the nostalgia i felt. Be well and happy in the new world and keep making makovniks! I have searched and searched for a poppy seed grinder – no luck. Even ordered one and the seeds just fell thru the grinder. Never did get my refund after we returned it. I don’t buy solo because it is so expensive and it has ingredents that I would not use. Maybe some one has an old working poppy seed grinder willing to sell. david’s idea above works great for me. It wouldn’t be Christmas without orechovy zavinach like my Babi used to make……I barely remember the poppy seed but the walnut were a staple at Christmastime growing up. She used the filling to make the roll and also kolachky which were the small crescents dusted with powdered sugar. I got an old walnut grinder on Ebay for a few bucks and it grinds the nuts perfectly…..not sure about the poppy seed, a coffee grinder might be better for them. I love the walnut so much I have never even tried to make the poppy seed and I remember she even made prune roll but I can pass on that. Where in Australia you can purchase poppy seeds filling? Help me who know. wished I like to bake like they did! Miss all the home made stuff! Thanks for the recipe for Holubky. and kind souls. Mary Jadud & Mary Ann Jadud Schuller of Cleveland, Ohio…bless their souls. I make poppyseed bread every Easter, Thanksgiving and Christmas. I use Rhode’s Sweet Bread dough (found in the frozen aisle). I tear each loaf in half before rolling it because the loaves are large. I buy fresh ground poppyseeds at the Eastern European Deli in Minneapolis (Kramarczuk’s). I have my old family recipe and it is delicious, but the loaves always burst open and some of the filling comes out. I don’t remember this happening to my mother’s or grandmother’s bread. Any idea what I’m doing wrong? How can I make it so the loaf doesn’t burst open? Ok … I know the purists will find this sacrilegious … but I’ve come up w/ a VERY fast & simple version. It cannot be nearly as good as well-made makovníčky … BUT it’s an easy way to teach a beginner, or even a 5 yr old beginning baking. It also uses readily available ingredients in most stores in the US. I can’t get poppy seeds nearby to make my own paste. 1 can Solo Poppy Seed filling from the baking aisle. That’s about the right ratio to get a LOT of poppy seed filling in each piece … but you can use 3 tubes of crescent rolls. Take the dough out of the tubes & mash it together … if you don’t their little seams will leak your poppy seed filling. Roll it out on a floured cutting board, cover w/ a moist towel & let rise in warm (90-100F) oven 30-60-90 minutes. When ready, roll it out about 1/4″ thick & rectangular. 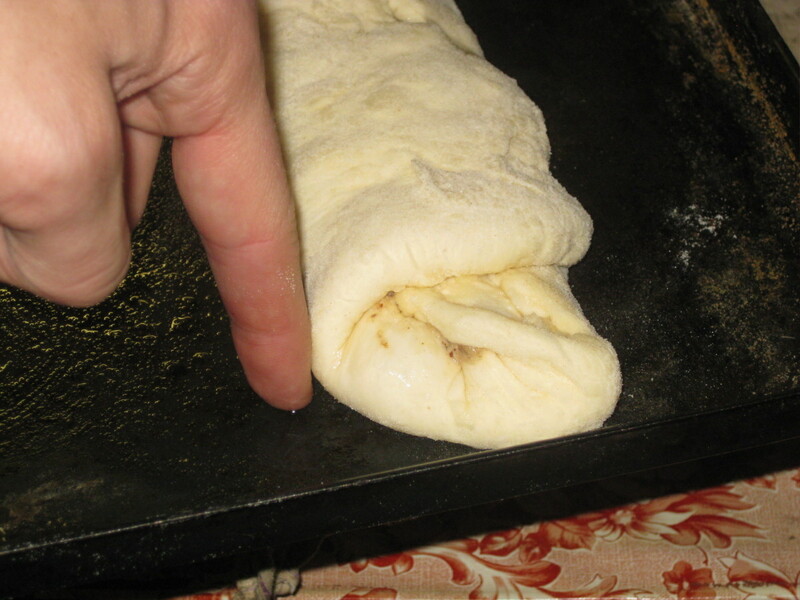 Spread w/ Poppy Seed Paste … leave 1-1.5″ clean on each side … about 1-2″ clean on the inside fold of the roll (where you start rolling) & maybe 2-2.5″ clean on the tail-end of the dough. Roll it up … and when 1/2-2/3 done, fold in the sides. Then finish rolling & seal the edges & ends w/ water. Put the seams DOWN on aluminum foil … with the foil edges folded up (to keep any leaks on the pan). Let rise another 30-60 min. You can paint the top w/ oil, butter, or egg white & water to give it a browner tan. I admit that this is NOT as good as my babushka’s … or your other recipes here … the Solo filling is a bit too sweet. But, the purpose is to have a quick, good (if not splendid) bread. Again, it’s a good start for a kid (or beginner) to learn baking. I’m 72 and have been trying to find something close to my mom’s recipe for Kolache. Everything was for pastries. Then I found this link. This is probably the closest I’ll ever come to duplicating it. Mama always made her Kolache with ground walnuts, and either made a loaf-shape, or rolled it out lengthwise (like here), and wound it into a snail-shape. All I know is that right now I’m bouncing off the walls with happiness. I think my quest has finally ended. Glad to hear that. Let us know how they turn out. My nutroll won’t bake. I do it on 350 for 35. What am I doing wrong? I am so happy right now! My grandfather was Slovak and used to make these every Christmas. When he passed no one could find his recipe. I have searched for a similar recipe and haven’t found anything until now. I am going to surprise my mother for Christmas with a poppy seed roll like granddaddy’s. Thank you! When i make this poppyseed roll or nut roll why does it always spilt down the side? I came from Slovakia after Russian invasion and miss the food! If you live in Melbourne or go there on holidays check some shops at Victoria markets mainly Polish shop and one near Bratwurst shop for poppy and Walnut rolls. Very nice, but I think my Mum makes the best! I am very happy to find like minded persons who miss their Baba and Dzedo. My Makovnik came out beautifully. I have the Slovak cook book from 1952 and I use it occasionally. I would not recommend Solo products, they have seemedto cheapen up over the lasr few years (like most co’s food products in US to earn more money), so it mostly has a really corn syrup processed taste. The poppies are especially bulked up with like anstarch in them too. I lived in US all my life, health food store chains are a hige rip-off for food items, selection can be awesome but way overpriced. I left US to my motherland for good healthy products, I eat like a king have lost 50 pds in a year and have gotten rid of most of my illnesses acquired through stress and poor food from US. I love eating fresh and for half the price of that it cost and around seventy in summer fall for all meats and foods. You can add a little lemon to the poppyseed rolls and rub some butter (real butter) onthe dough prior to fill. My mother and aunts made these every Christmas. They all used the same recipe from their mother. My Aunt Marie’s always turned out perfect, but the others’ always split down the top, no matter what they did. My mother even had her sister Marie come to our house and use our oven to see if it was the oven that was the difference. Nope – Mom’s split, my aunt’s didn’t. Drove Marie’s sisters nuts.